Baskin’s Ace has been a community partner for 40 years through their sponsorship of many local organizations and causes. Baskin’s has contributed to many local campaigns by offering money, gift certificates and even products to small local campaigns, as well as to larger national organizations with a local impact. Baskin’s has also taken the initiative to collect contributions from our customers for specific causes and then paying those proceeds directly to the organization or people in need. 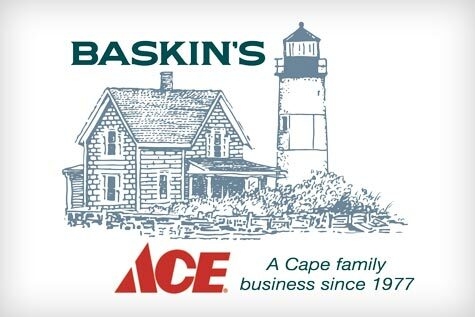 Baskin’s also has been able to directly sponsor individuals in our community who have endured major life setbacks, as well as supporting local Cape Cod organizations chartered with preserving our quintessential Cape Cod. Baskin’s actively supports several environmental initiatives through the local conservation trusts in different communities. Baskin’s Ace embraces the value of being a community partner and giving back to the people and the communities which have be an integral part of our business success over the past 40 years.